There's an entire world under your feet, saturated by colors out of space and patrolled by colonies of bandit animals. Once in a while, you are able to visit. Here is what it looks like. 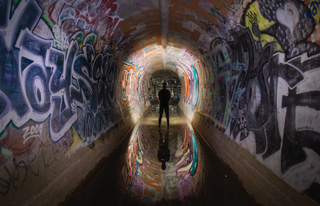 In today's issue of San Francisco's Bold Italic, there is a terrific photo essay about the city's underground spaces. Some of these are viaducts, and others are service tunnels. All of them are full of haunting reminders that humans live down here sometimes, as do animals. Raccoons peek out to look at you. Here's a dazzling glimpse upward, into a ring of lights that turn out to be the holes in a manhole cover. Visit the world under San Francisco's sidewalks at The Bold Italic.